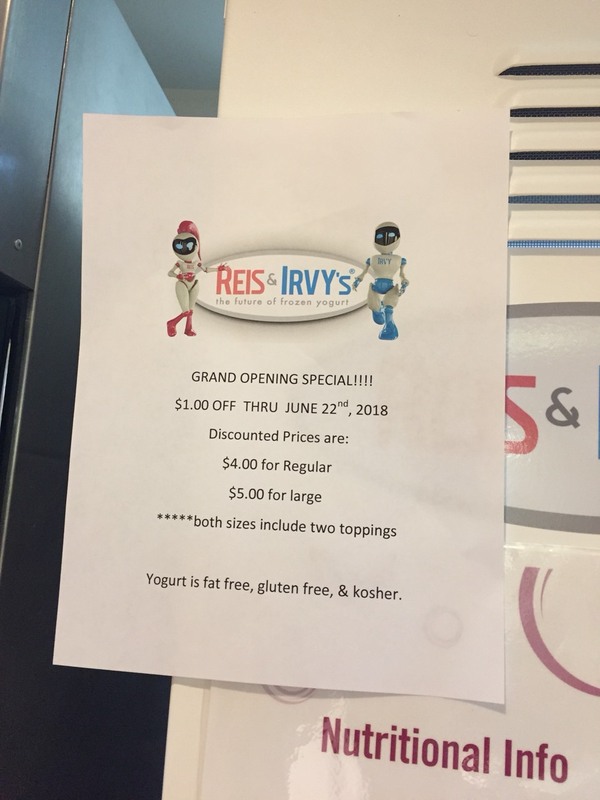 Generation Next Franchise Brands’ (VEND) $130M market cap is based on the potential success of its sole product, a frozen yogurt vending machine called “Reis & Irvy’s” or “Froyo Robot”. As the company has only just begun delivering Froyos, its revenues are miniscule. The company also loses a lot of money, reporting a $5M loss in quarter ended 3/31/18, a $3.8M loss in 12/31/17, and a $4M loss in 9/30/17. We conducted in-field research on the company’s new Froyo installation in Philadelphia. In the day we were there, we witnessed it made considerably less sales than the company is claiming it does. Upcoming catalysts: 12.8 million VEND shares sold in a private placement at $0.50 apiece on January 2nd will have a lockup expiry on July 2nd. This will double the float. We believe most of these shares will be sold. Another negative catalyst is VEND has been trying for months to get investors involved in their next private placement at $1.50 per share. This private placement will happen any day now as the company is almost broke and has a negative shareholders equity. The Froyo is not “the future of frozen yogurt” like the company claims. It was created in 2007 and has already been tried and commercially failed. There are several YouTube videos that are 5+ years old of almost the exact same Froyo robot as VEND is marketing today. VEND acquired Reis & Irvy’s intellectual property assets from its creator, Robofusion, in December, 2016. There are also many other frozen yogurt vending machines being sold today. VEND’s healthy snacks vending machine business has commercially failed and was discontinued by the company in 2016. We believe the Froyo is an even worse vending machine idea and will also fail commercially. VEND management was tried and convicted of fraud in regards to statements made to customers about their last vending machine. VEND has only just begun delivering Froyos this month, despite having reportedly booked 1,000 units aggregating $41 million in deferred revenues, dating back to 2016. In its 10-Q for quarter ended 3/31/18, VEND reported $36.3M in customer advances and deferred revenues in its current liabilities. Even though the company received $23M in cash received on the Froyo orders, the company has instead spent that cash on operating expenses as it’s almost broke. The company reported a stockholders deficit of ($17.7M). VEND reported unrestricted cash of only $5.3M in quarter ended 3/31/18. At a $4M+ loss per quarter, not counting cash coming in from new orders, that would put the cash balance at a little over $1M by 6/30/18. VEND has recently spent more than normal on R&D. It spent $1.7M last quarter, compared to $435K on quarter ended 3/31/17. In the latest 10-Q it states: “Given our current cash position, we may be forced to curtail our plans by delaying or suspending the production and purchase of frozen yogurt robots until such time that we may be able to prepay for the robots.” What that means is if they can’t raise the money to purchase the robots that their customers pre-ordered from them, then the company will either have to raise more money, or declare bankruptcy and not fulfill their obligations. The total amount of daily and monthly expenses to maintain a Froyo are very high, and make it a bad investment at almost any type of location. Additionally, 12% of franchisee revenues go to VEND as a franchise fee. We break down the expenses per Froyo in the report. In order to break even, each Froyo will have to generate $2,840 per month. At $6 per cup of frozen yogurt, that’s 15 cups sold every day. Not a realistic number in almost any location. The company has a list of possible locations for the Froyo however most do not have the needed foot traffic of prospective customers to make it a suitable location. There’s no institutional ownership in VEND. Just a bunch of scattered retail investors. VEND’s only competitor, the Frobot, is the only other frozen yogurt vending machine company, has the same number of employees as VEND, about 43, and an estimated annual revenue of only $4.5M. VEND will likely not have significantly higher revenues than that over the long term, making the stock significantly overvalued today. Generation Next Franchise Brands (VEND) has all of the ingredients to make a great short. It has almost no revenues, an impractical, lousy product, a promotional management that has been convicted of fraud, former product failures, multiple equity raises, no institutional ownership, and two upcoming negative catalysts. VEND is a vending machine operator based in San Diego, CA. The company was formerly known as Fresh Healthy Vending Intl, but after their Fresh Healthy Vending machine commercially failed, it changed to its current name, Generation Next Franchise Brands, in March, 2016. It discontinued its Fresh Healthy Vending machine in 2016 and has transitioned to its current vending machine product that serves frozen yogurt and ice cream called the “Froyo”. Given our current cash position, we may be forced to curtail our plans by delaying or suspending the production and purchase of frozen yogurt robots until such time that we may able to prepay for the robots. VEND doesn’t have any institutional ownership to support the company in their capital raising needs. At the time of this writing, there are over 300k shares available for shorting on Interactive Brokers. From speaking to colleagues, we found that other brokers that cater to short sellers also have hundreds of thousands of shares available to short. Before going into an analysis of the valuation of the company, let’s first analyze two upcoming strong catalysts that make the short opportunity more compelling and urgent. An equity raise the company has been planning for months that will happen any day now. A lockup expiry on July 2nd for 12.8 million VEND shares that were purchased for $0.50 apiece in a private placement on January 2nd. We contacted the company on May 15th with a list of questions. Immediately VEND’s Chairman, Nick Yates, asked if we are looking to invest in their available private placement at $1.50 per share. The company is now broke and badly in need of cash. The company lost $5M in quarter ended 3/31/18. It only reported $5.3M in cash and $2.4M in restricted cash that quarter. Mr. Yates also dodged some of our questions. A colleague said his investment firm was pitched back in April to get involved in this private placement at $1.50 per share. He said the salesman had blatant and dirty selling tactics. He would tell them to “hang on a second” from time to time and then act like there were a bunch of investors calling on the other line excited about the deal. My colleague could see through it and described it as comical, like a scene out of the movie “Boiler Room”. We believe most of those 12.8M shares will be rapidly sold upon the lock-up expiry. If you put yourself in the shareholders’ shoes, you can understand why. After participating in this private placement, as shown in the above chart, they held the stock for two months with it staying under $1. Then, to their delight, the stock rips to over $2 per share in March. Meanwhile, they have witnessed the company’s delays, missed goals and large quarterly losses. The company hadn’t delivered or recognized a single sale of a Froyo, until just recently. On May 30th the company made an announcement that it’s doing its first 50 Froyo installs. We estimate about 10M of those 12.84M shares will be sold by investors as soon as possible. Even if the price per share falls to $1, that’s a 100% gain for these investors in six months. An excellent return by any measure. We don’t see any reason for those shareholders to hold onto their shares, as we believe that they were just in it hoping the company would succeed in pumping and promoting the stock. Let’s conservatively assume only 6M shares get sold. It would take the sale of 50k shares a day for 120 days, about 7 months, to finally sell the 6M shares. 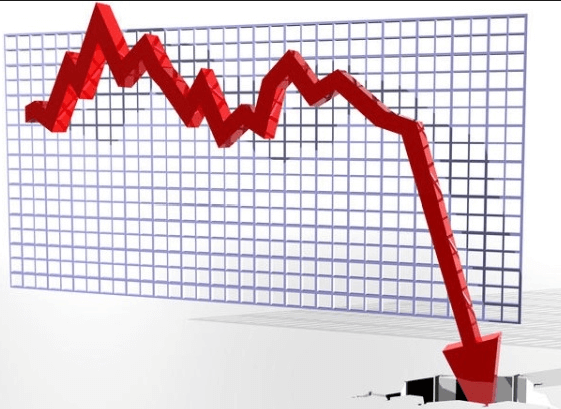 As the stock only averages volume of about 150k shares per day, millions of additional shares being sold into the market will have a significant effect and downward pressure on the share price. The company said in its investor slide deck on 3/2/18 that there were approximately 45M shares outstanding and a float of 12 million shares. Once the 12.84M shares are freed up, that will double the float. 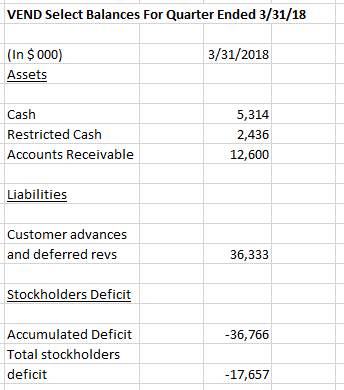 VEND’s SEC filed balance sheet for quarter ended 3/31/18 shows 55.8M total shares outstanding. Furthermore, those shareholders know that another 6M+ shares will become unlocked at the end of the following month, August, and then another 7M+ shares will be freed up the next month, September. They now have to worry about those shares being sold on the open market, further pushing the price down. As stated in the above section, the investors of the private placements this year have been waiting patiently for their lockup period to expire. During that time, they have seen how many times management made promises they couldn’t deliver. – launched April, 2016 the Reis & Irvy’s Franchise brand. – Company anticipates beta phase units in March/April, followed by full-scale production in 2018 allowing a rollout of up to 250 units per month. This beta rollout in March/April didn’t happen. On May 30th, VEND announced its first 50 location installs to happen in the month of June. We’ll see how that plays out and if VEND really follows through with the 50 locations this month. Last year, VEND made many tall predictions that fell flat. From April 2016 through December 2016, the Company generated over $16,500,000 in franchise bookings for our new Froyo Robot (recorded as deferred revenues until Robots are installed) and over $19 million in total franchise bookings. Booked our 500th Froyo Robot in December 2016. Booked our 500th Froyo Robot in December 2016. Please note that all franchise bookings are recorded as deferred revenues on our consolidated balance sheet, which as of September 30th, 2016 aggregated $14.6 million. Once the Company commences delivery of the Robots, the deferred revenues will be recognized as actual revenues on a pro-rata basis. The deferred revenues are a liability for the company until they are able to deliver the Froyo bots. Launching our corporate-owned operating model and partnering with a national retail chain. Generating positive reportable net income. Introducing the market to our next robotic vending concept supported by additional patent applications. VEND didn’t complete any of those 2017 stated goals. SeeThruEquity has a price target of $2.85 on VEND. So far, VEND has close to $0 in sales. If they don’t get anywhere close to their goal of $90M in sales this year, then SeeThruEquity should downgrade the stock and lower its price target. However, it’s unlikely that would happen because SeeThruEquity is biased as it is paid directly by VEND and other companies it covers. As stated in the disclosure section on its website: The company discussed in its reports have paid cash and/or securities to SeeThruEquity for some or all of the above described services. A franchisee of VEND’s Fresh Healthy Vending machines, John Coffin, had a horrible experience with the machines and lost a lot of money. He sued VEND and its management for falsely presenting their product – and won. VEND is no longer selling or marketing these Fresh Healthy Vending machines, and has pivoted to only selling the Froyo Robots. On May 28, 2014, Slender Vender, LLC, and John Coffin, a former FHV franchisee and its owner (“Plaintiffs”), filed a complaint against FHV LLC and certain of its current and former officers (“Defendants”) alleging violations of the California Franchise Investment Law, fraud, breach of contract, unfair competition, false advertising and violations of the California Labor Code in connection with the sale and purchase of Plaintiffs’ franchises. On September 23, 2016, a jury trial commenced in the action, and the jury found in favor of Plaintiffs. Defendants agreed to pay Plaintiff $500,000, over a 25-month period, as well as a guarantee of $200,000 of securities valued at $1 per share. GNFB has guaranteed the settlement. Losing a court case and being convicted of fraud, as well as other transgressions, is not a good look. This goes beyond management just being optimistic about their product and goes into the territory of outright lies and scams. 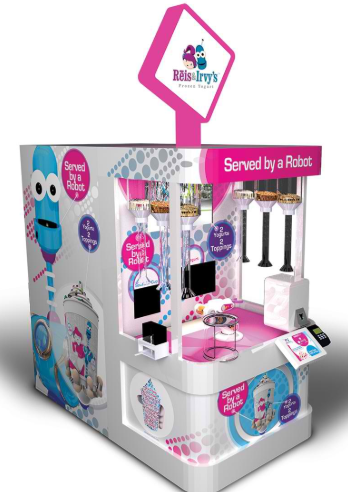 On VEND’s website, froyorobots.com, the headline says: FROYO Robots – The future of frozen yogurt! But in fact these machines aren’t the future of frozen yogurt. They’re actually the past. They’ve been tried and failed to acquire commercial adoption. Frozen Yogurt vending machines have been around for awhile. You can see here is a list of many frozen yogurt vending machines. The prices are much cheaper than the $50K price tag for a Froyo. If you do a Youtube search of “Reis And Irvy” you’ll see many videos that are 3-6 years old showcasing the same Froyo frozen yogurt machine. A few of these videos are here, here, and here. Clearly if this was a big hit, it would have succeeded by now instead of being sold to VEND for a relatively low price compared to VEND’s current market cap. The market cap of VEND of over $100M implies that shareholders think this will be a disruptive, popular technology. As stated in VEND’s recent 10-K, the company had discontinued selling its previous Fresh Healthy Vending machines and acquired the Reis and Irvy machine intellectual property from its developer, Robofusion. VEND paid Robofusion a cash payment of $440,000, a three year $2M note and a five-year common stock purchase warrant for 1,520,000 shares with a strike price of $0.50 per share. In VEND’s investor slide deck from March 2, 2018, the company claims it tested three of its Froyos in 2016 and they averaged $91k in revenues. To put it simply, we believe those numbers are fabricated. We don’t believe in the real world the Froyos would be able to get anywhere close to those sales numbers except possibly in very extreme types of locations. Conveniently, VEND doesn’t reveal the locations of the Froyos for the field tests. 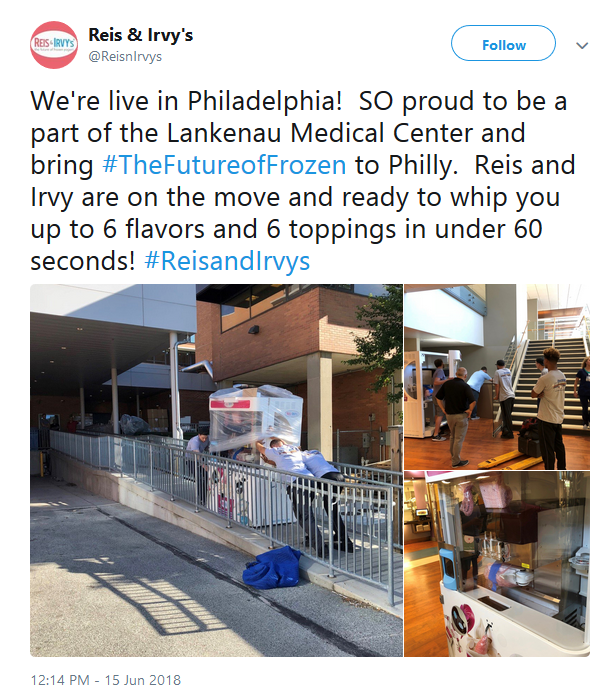 From the above tweet, a Froyo was installed in the Lankenau Medical Center in Philadelphia. How many cups of frozen yogurt per day would the Froyo be able to sell in a hospital? We don’t believe very many. Looking at the details of the Lankenau Medical Center, there are 331 beds for tertiary care. Tertiary care patients are in serious condition, requiring specialized techniques such as for the treatment of severe burns or cancer treatments. How many yogurts per day are these patients going to eat? We don’t assume they are in a stable enough condition to eat that kind of junk food. From the hospital website, it lists 335 doctors. How many of them are going to be eating that many yogurts daily? There are going to be some fat doctors if the Froyo reaches those test numbers. In reality, we believe the Froyo would be lucky to average 15-20 cups per week at a hospital such as this. But let’s conservatively estimate the Froyo sells 4 cups a day, which comes to about 122 per month. At $6 a cup that comes to: 122x$6 = $732 in sales per month. As we show in the next section, we estimate the amount of sales per month needed for the franchisee to break even on a Froyo is $2,840! $732 revenues per month isn’t even close to break even. Philadelphia is also very cold during the winter, with temperatures often below 40 degrees. Frozen yogurt and ice cream sales would decline during the winter season. The Froyo is located in the medical center’s cafeteria. Two Generation Next employees were standing next to the machine, talking to people and promoting it. There was a sign taped to it announcing a $1 off sale. $4 for regular size, $5 for a large through June 22nd. Around 70 people entered the cafeteria in the morning, some people tried the machine but couldn’t figure out how to use it. From 10:30am until 3:30pm, our contact saw 9 people order a cup. The touch screen was confusing regarding when to enter the credit card and pay. It only takes exact change if paying cash. Our contact said he buys fresh frozen yogurt with real fruit toppings near his home for $5-$6. He said he wouldn’t pay more than that and doubts that other people would. We also believe the Froyo sold 2 cups per hour, as seen by our contact, because it’s a new attraction at the hospital. Once it has been there for awhile and the novelty wears off, we believe the sales will decline. From the day our contact went in to check it out, this statement is false. There was not a line in front of the Froyo. There was only 9 sold between 10:30am and 3:30pm. 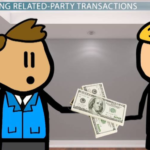 This video shows a financial model of what it would require for a 3 year startup purchase of a Froyo robot. If the financial model numbers are accurate, we can’t imagine that this investment would be worth it for anyone, anywhere in the world. Except possibly extreme cases for an owner of a theme park that consistently gets a ton of visitors with kids, but even then it might not be worth it for the costs required. VEND’s Director of Franchising, TJ Rogers, told us that the minimum franchise package is three robots at a total of $150K ($50K each). Our colleague asked Mr. Yates about this cost model and he just said that they haven’t endorsed or knew about this model. What isn’t included above, is the cost of goods sold (COGS) and a 12% franchisor royalty on gross sales that VEND charges. The COGS is mentioned later in the video, and it’s estimated to be about 20% of sales. 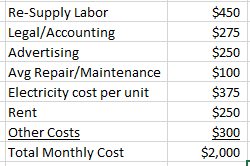 Taking into account COGS, using the $2000 total monthly cost figure, we have a breakeven number of $2000/(1-0.20) = $2,500. Adding the 12% franchisor royalty, we have: $2,500/(1-.12) = $2,840 per month in revenues needed just to break even. This comes to about $93 average revenue per day, every day, assuming there’s 30.5 days in a month. That seems like an entirely unrealistic revenue number, as it would require a location with many prospective customers on a consistent daily basis to be near the machine. As stated on that website, $5 is on average the price per cup at Pinkberry, and that’s with a paid employee serving you. This Froyo machine is supposed to deliver yogurt for a lower price because it’s automated and doesn’t need to hire an employee to serve it. But it’s actually more expensive for the customer. That’s why we estimate the cost per cup would realistically be around $6. The above table shows that for one unit alone, you should expect to get 15 sales per day for the first year, 25 for year 2, and 28 for year 3. To us, these numbers seem entirely unrealistic. Assuming a 12 hour day, 25 sales per day would be about 2 per hour on average, and that’s every single day, 365 days a year. 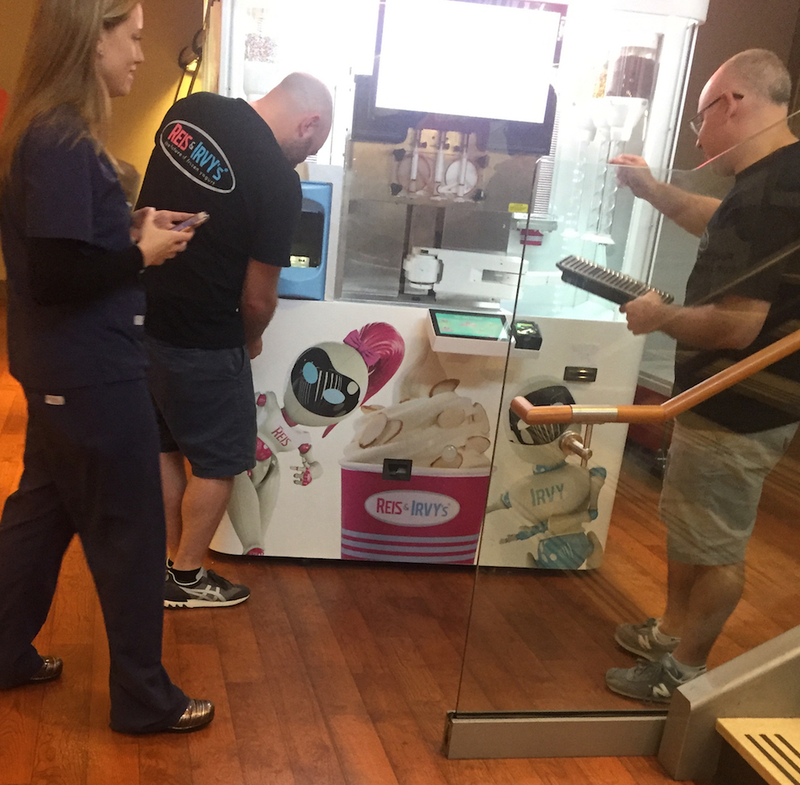 To average that many sales, the machine would have to be in a place with a crowd of people always around, looking to have fun and pay a high price for a cup of yogurt from the Froyo Robot. The reality is, most vending machines can have hours and even days of a dry spell with few to no customers. It’s unrealistic to believe that the Froyo would be much different and there would be a feeding frenzy for frozen yogurt from an automated machine. Many people eat frozen yogurt as a social activity at a restaurant like Pinkberry. People normally don’t go to a vending machine on its own just to feed themselves. Colleges & Universities: Those must be rich college students to be able to buy an $5-$11 cup of yogurt on a regular basis. Restaurants & Cafes: Would you really want to buy a yogurt from a vending machine when you could have it hand made at the restaurant or cafe? Gas stations: Who would trust the sanitation of a yogurt machine at a dirty gas station? 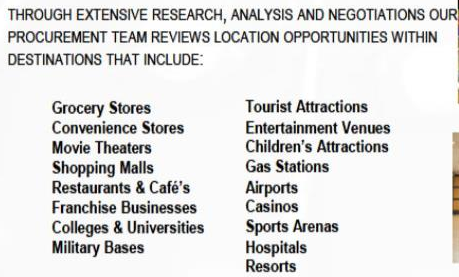 Shopping Malls: Probably you can get something better and cheaper at the food court in the mall. Sports Arenas: There would possibly be enough people around to fulfill this many daily sales at a packed sports arena. But sports arenas typically don’t have events every single day, therefore that kind of daily volume wouldn’t be possible there. We believe the only way it would be possible to get the required amount of daily sales would be if the machine is located at a theme park on a day with a large attendance of parents and their kids. But most theme parks don’t have a large attendance every single day. And if they do, then the rent would likely be high to have the Froyo placed there, or the theme park owner would require a large percentage of sales. It’s likely that the Froyo would appeal more to kids than adults. An adult might try it once out of curiosity for the technology, but we doubt an adult would be a repeat customer after trying it the first time. In fact, in VEND’s own video on the Froyo, almost every featured customer of the machine was a kid with their parent. VEND claimed to have 500 Froyos preordered by the end of 2016. Yet with all those above bookings, some from 2016, VEND still to this day has not recognized revenue for a single Froyo Robot. “As of December 31st, the unearned revenue carried on the company books related to robot sales and franchise fees was $32 million. And how much revenue has actually been recognized at this point? Well… zero. I truly believe this may be to the company’s advantage though. What this author means by this statement, is it’s good for VEND that they haven’t really sold any Froyos, because then they can BS about how much revenue potential they have. If they actually sold some Froyos, then the truth would come out about their sales numbers. Well, the truth will come out soon, as the company appears to be committing to deliver the Froyo Robots. As of March 2016, we have discontinued marketing our healthy vending franchises, although we continue to support our ongoing franchisees. Furthermore, we have sold our corporate route and no longer operate our own healthy vending machines. From the above statement, VEND’s Fresh Healthy Vending machines are so unprofitable, that the company doesn’t even operate its own placed machines anymore. Yet, on its website, freshvending.com, which is listed as their company website on Yahoo finance, the company still features their healthy vending franchise. “Join the Fresh Revolution” it says and “We were recently awarded Entrepreneur’s title of both Top New Franchise of 2015, and #1 Category 2015/2016 (Franchisor) Inc. But the company doesn’t market or sell these Fresh Healthy Vending Machines anymore. VEND does however still support franchisees who still have and operate these machines. With VEND discontinuing its Fresh Healthy Vending machine sales, and not recognizing Froyo orders as revenues, its sales have fallen off a cliff. As shown above, the customer advances and deferred revenues are pre-orders the company received from customers dating back to 2016. But that balance is a liability because now VEND has an obligation to produce and deliver those machines. Already, VEND has spent those funds on operating expenses when it was meant to go to producing the Froyos. Therefore, VEND needs to raise more money to produce the machines now. If VEND is unable to raise the capital, then it won’t be able to deliver those machines to the waiting franchisees, and could need to file for bankruptcy. VEND only has one competitor. It’s a company called Frobot and, according to Owler, it does a tiny estimated $4.5M in annual revenue, and has 43 employees. The reason why there aren’t more frozen yogurt vending machine companies, is likely because it’s not very appetizing for most people to get frozen yogurt or ice cream out of a vending machine. If you look at the typical vending machines, the food or drink is packaged and sealed. That way customers know that the food or drink is without contamination. However, with a frozen yogurt vending machine just sitting there by itself, the customer doesn’t know how long the yogurt has been sitting there, or if it’s sanitary. For all they know the yogurt is old and has been sitting there for many days. Whereas with a vending machine, at least you know the food and drink is in an air-tight package with an expiration date on it. On June 20th, VEND put out a PR stating that the golf hall of famer Phil Mickelson purchased 30 Froyos. This news was also announced in several news outlets. We believe this news is BS and is just a way to try and pump the stock before the company’s upcoming lockup expiry and private placement. It didn’t work, as the stock closed red on June 20th. Level Brands (LEVB), another scam we recently reported on, did similar pump tactics ahead of its lockup expiry. We don’t believe Mickelson would invest in those boxes of goop and concern himself with them. We believe he is part of the VEND scam and is doing this to help boost the stock. Mickelson has had a history of shady activities to make money, including insider trading. He also lives in San Diego, where VEND HQ is located. He probably met and buddied up with the VEND executives at some point and they offered him some easy money. He’s probably getting paid off by the company somehow, and we don’t believe he’s going to invest or manage a single Froyo. If The Froyo Robot Is Such A Game Changer – Then Why Have They Only Just Started Delivering? In the real world, usually if there’s a new product that is forecast to be very popular or disruptive, the company selling it tries to get it out ASAP. The reason why is common sense – the successful sales of the product will then breed more sales and the company can expand. Delaying would come at the expense of profits. For example, when a pharmaceutical company is very confident that their drug will get FDA approval, they have the packaging and label all ready to ship out the drug within the week of getting approval. As we showed earlier in this report, the Froyo is not a new product, it has been around since 2007. But let’s pretend that it is new. Why didn’t VEND get it out into the marketplace right away to start collecting the 12% franchise fees and get positive testimonials? VEND had a goal in January, 2017 to become profitable and cash flow positive for 2017. But only now, they are delivering the first round of machines. That’s very suspicious. We’ll see how the company follows through on their rollout. We wouldn’t be surprised to see more delays, and more covering up what we believe to be the truth that the machines are not profitable.